Ask any boy scout to offer you some advice and they’ll tell you the same thing – be prepared. If there is any group you should listen to when it comes to surviving the outdoor life it’s these young men, and many of them will claim a good backpacking knife is the first thing they pack. The idea of one of these knives is that they are multi-purpose; you should be able to squeeze a multitude of different tools into your pocket using one knife. With this in mind, what features will actually be useful, and what will just take up needless space in your pocket or backpack? Before you even start thinking about models of backpacking knife, consider the size of the tool. These are often described as pocket knifes for a reason, and regardless of how much backpacking and camping you do, you really don’t need a Rambo-style oversized hunting blade on your person. You’ll need something big enough to cut wood for a fire, sure, but equally nothing too large to work on more delicate procedures, or to use as a makeshift screwdriver when erecting a tent. Around five inches should be a sweet spot. Of course, you’ll be able to save more space by choosing a foldable model. The downside of such a knife is that they are more liable to break thanks to the join between blade and handle – a fixed knife will be considerably more solid, and sustain more punishment. On a similar note, look into a non-corrosive model of blade; while it’s obvious that rainwater can damage metal, but so can certain foods that you may be slicing which contain acids. Whether you are looking for a serrated blade depends on what you are looking for too. These make it considerably easier to saw through tough ropes and other such materials, but they can be a real pain to sharpen and clean. The tip of your knife is also up for debate – obviously rounded edges are safer when not in use, but a sharp edge may be handier for pernickety jobs such as removing splinters. Check for a handle that is comfortable but solid too; you don’t want anything that is liable to rot or provide any kind of shock impact that may damage your arm when in use. ​A Jack of All Trades? 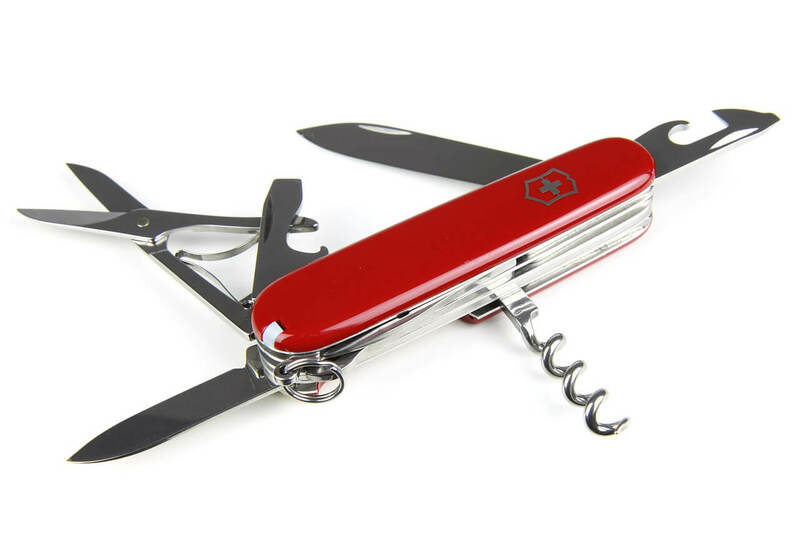 Of course, one solution to all over the above, especially for a casual camper or backpacker, is a Swiss army knife. These items may be jacks of all trades and outright masters of none, but if you are looking for a blade that will help you prepare food, trim guy ropes and cut firewood down to size you can’t go far wrong, with the inclusion of extra features such as screwdrivers and can openers a helpful bonus. 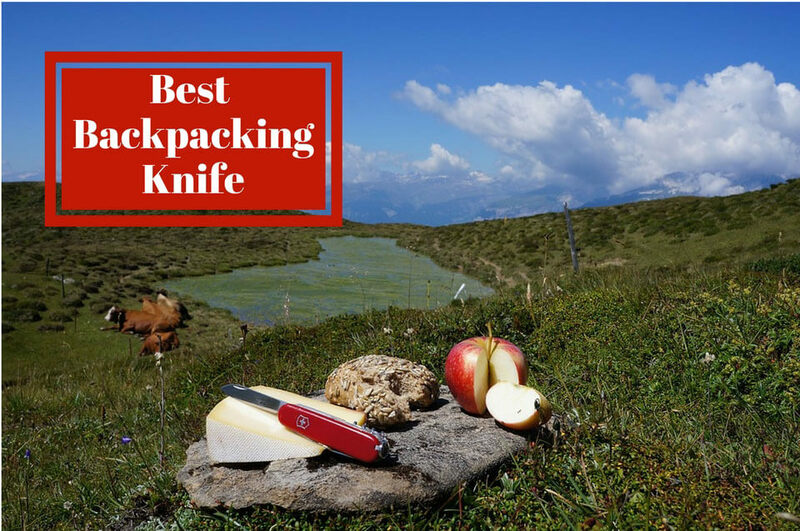 Surely, a Swiss army knife may not offer much protection if you find yourself under attack from a bear or plan on engaging in live game hunting, but few tools will be as useful to the novice backpacker. 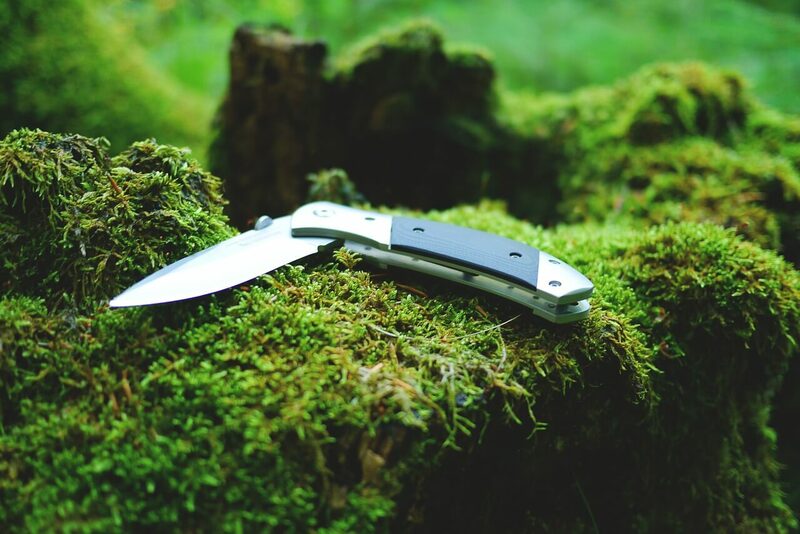 Intrigued enough to look into the purchase of your first backpacking knife? Great. Here are some recommendations of what may be ideal starter points for you. 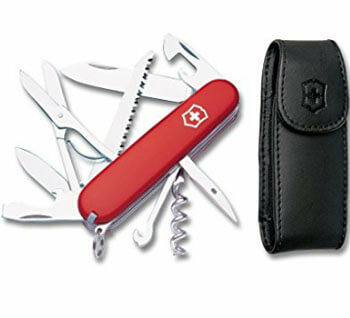 Let’s start from the top by selecting a popular and undoubtedly useful multi-purpose Swiss Army Knife. This model contains everything you could possibly need, including numerous blades, wire cutters, a screwdriver and a bottle opener and corkscrew for when it all that outdoor activity gets too much and you need a drink. The ideal option for any novice backpacker, with the lightweight quality and variety of tools on this Swiss army knife covering all bases. PROS – Likely to get you out of any number of tight spots while out backpacking or hiking, you’ll save a whole lot of space in your rucksack by slipping this into your pocket. CONS – For the serious backpacker, this may be good at most things but great at nothing. Despite the moniker, it’s also not really going to impressing any experienced huntsman – especially when it costs three times as much as a standard knife. It’s safe to say that Bear Grylls knows a little something about life in the great outdoors, so if he is prepared to lend his endorsement to a product you can rest assured that it’s fit for purpose. 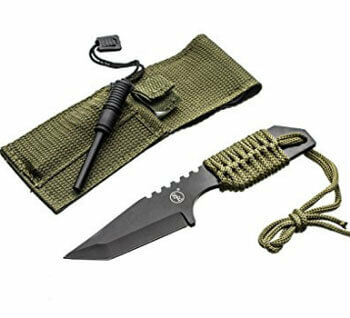 This serrated fixed blade has a solid and sturdy feel, comes complete with an integrated firestarter and sharpener, and is versatile to be used as a hunting tool if necessary. PROS – Gerber are a highly reputable outdoor brand, so pairing with Bear Grylls seems like a marriage made in heaven – this knife is strong and sturdy, and able to cut through most anything. 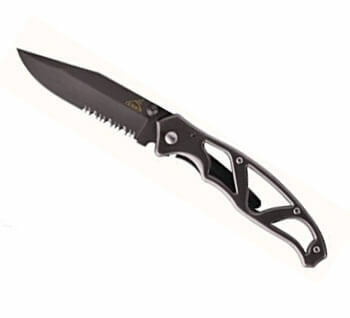 CONS – It is a lot of money, especially for a serrated blade as that is not the ideal choice for some backpackers. The sheath could also be a little better. Perfect for cutting or carving wood or tinder, this is a budget-friendly option for any budding frontiersperson. The fixed blade itself a little shorter at 4.1” but manages to pack plenty of power into that small space, and the steel is carbon-based which means it will require a little more TLC to prevent rust, but it’s lightweight, easy to sharpen, packed with quality sheaf and pleasantly cheap in price but not quality. PROS – You probably won’t find a more reliable knife at this price point – this blade does what it is designed for, and does it well. CONS – As mentioned, the blade is made of carbon steel so you’ll have to take good care of it lest you experience an early onset of rust. 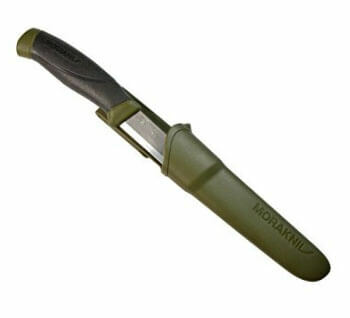 If the Morakniv Companion was pleasantly budget-friendly, the SE KHK6320 will have the eyes of anybody looking to save a few dollars lighting up – you’ll have change from ten bucks if you choose this reliable option. The fixed blade may only be 3” long but it offers both straight and serrated edges, and the rope handle ensures that even if soaking you won’t lose your grip and end up in the ER. The small and no-frills nature of the SE KHK6320 makes it hugely versatile and adaptable, and the perfect addition or starting point to to any collection. PROS – Small enough to slip into a boot, and with straight and serrated edges (both of which are deceptively sharp) to accommodate any need, this knife is also cheap enough to purchase multiple units. CONS – The nylon rope grip may be handy in wet weather, but sooner or later you’ll probably have to replace it with something a little more hardwearing. 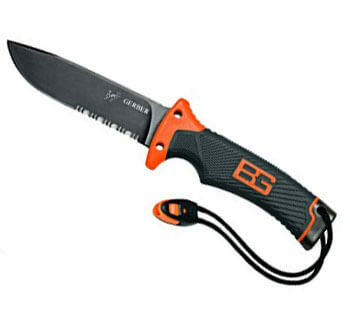 Another serrated blade from the ever-reliable Gerber, but unlike the Bear Grylls Ultimate Knife this model is significantly gentler on the wallet and retractable. With the blade itself coated in titanium this knife is extremely lightweight and easy to carry and clean but extremely tough, with the only potential downside being that the blade itself only measures 3”. PROS – Aesthetically pleasing, easy to clean, tough and sharp and as light as a feather, this is a really handy piece of kit to keep on your person without having to worry about excess weight of dimensions. CONS – As mentioned, the blade itself is a mere 3”, and the locking mechanism isn’t always reliable – this is certainly not a knife to leave within the reach of children.